The Cards I Collected, Now What? It’s better to get theirs than give yours. Because then YOU control dropping them a line. It puts the power to respond back in your hands. That's good to know because I can never find my cards in my purse and never remember to stuff a few in my pocket. Once you get home, do your best to find the most pertinent business cards you collected during the experience and drop a quick, personal email. Remind them in that brief contact about something you both discussed, to connect your email address with the experience. And then, if you’re feeling a little more adventurous, try some of the following additional bits. If you blog, blog about the event, and drop names. Tell people about the event, but also about the people you met that you found engaging. Sorry, but it’s still true that we love to see our names in print. If you’re a videoblogger, or use a photo service like Flickr, edit and upload your media quickly. Use tags to ensure that people attending the event find your post, and tag the names of the people you mentioned in the post as well. Make it easy to be found. Now, go find other people’s blog posts about the event, and leave comments. If you’ve met them at this event, make sure to drop a comment on their blog and remind them of your your meeting. Build the most important of the business cards into whatever you use as a contact database, and if you can, in the notes/comments section, mention that you met the person at X event. That’ll help when months from now, you get an email from them, or you see an event coming up that might appeal to people you met at X event. Make sense? Look for these new friends on sites like LinkedIN, Flickr, MySpace, Twitter, and wherever else is an appropriate social network for the group you’ve found. 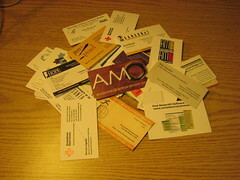 I came back from PodcampNYC with a bag full of cards. I loved the post by Chris Brogan, and I'm so glad you picked up on it and also documented it, because I didn't have any cards to give out, but gladly accepted them, very gladly. So Beth, what would we have done if both of us were in the same space with no cards? I would have Bluetoothed you my contact info I guess? hi beth. 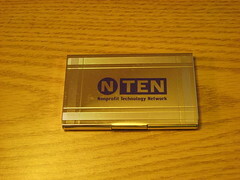 it was nice to meet you at the nten conference this year. day of service was great (glad you convinced me to do it). good luck with all the stuff you are working on.